Nintendo Download, Oct. 18, 2018: Praise the Sun! DARK SOULS: REMASTERED – Re-experience the critically acclaimed, genre-defining game that started it all. 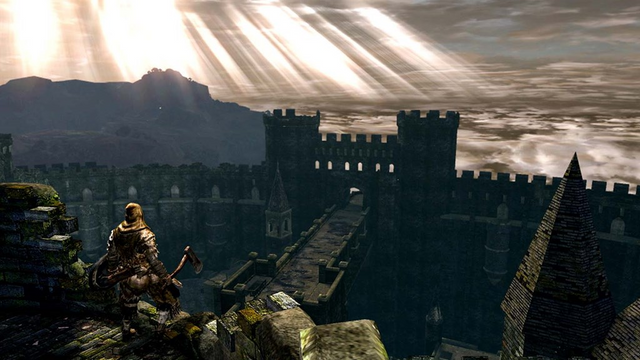 In this beautifully remastered game, return to Lordran in stunning detail. DARK SOULS: REMASTERED includes the main game plus the Artorias of the Abyss DLC. The DARK SOULS: REMASTERED game is available Oct. 19. Zarvot – This is a game of cubes – tiny, adorable cubes with hopes, dreams, unrequited loves … and unlimited destructive power. In Story Mode, you’ll follow the adventures of Charcoal and Mustard as they search for the ultimate birthday present to cheer up their best friend, Red – who is feeling quite blue. In Multiplayer Mode, invite your friends and challenge them to cutthroat competitive cube combat. Just Dance 2019 – The Just Dance 2019 game features 40 hot tracks from chart-topping hits to family favorites, including “Havana” by Camila Cabello, “I Feel It Coming” by The Weeknd ft. Daft Punk and more. Your Just Dance experience is now personalized as the game learns your dancing habits and suggests content. Just Dance 2019 launches Oct. 23. - Luigi’s Mansion My Nintendo Platinum Points – Can you help Luigi find the FOUR hidden Boos on the Luigi’s Mansion website? You can earn 25 My Nintendo Platinum Points* for each Boo you find. - Nintendo Account Linking Event! –You can redeem 300 Platinum Points within My Nintendo before 11 p.m. PT on Oct. 22 for 20 Leaf Tickets that can be used in the Animal Crossing: Pocket Camp app! Details can be found by visiting https://my.nintendo.com/news/18e13ab8c6e6e2bd.